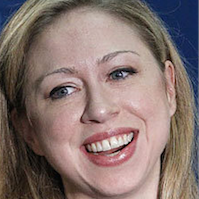 Chelsea Clinton is the daughter of former President Bill Clinton and former Secretary of State Hillary Clinton. Says Chelsea Clinton’s bodyguard "Jack Gordon" was found dead in a river after telling "damaging information" to federal prosecutors. Says "Gary Johnson and the Libertarian Party want to get rid of the public school system." Says Bernie Sanders’ health care plan would "empower Republican governors to take away Medicaid, to take away health insurance for low-income and middle-income working Americans."